The U.S. Bureau of Labor Statistics has released the Annual Inflation rate today. For the year ending in February, inflation was 1.13% down roughly 1/3rd from 1.58% for the year ending in January. Monthly inflation was relatively high at 0.37% in January and the same again in February. This is consistent with the historical trend of low inflation in the 4th quarter and high inflation in the first quarter of the year. The Consumer Price Index came in at 234.781 in February which was very close to what it was back in September of 2013 when it was 234.149. This is the result of three intervening deflationary months of October, November and December which “rolled back” prices to almost August levels when they were 233.877. 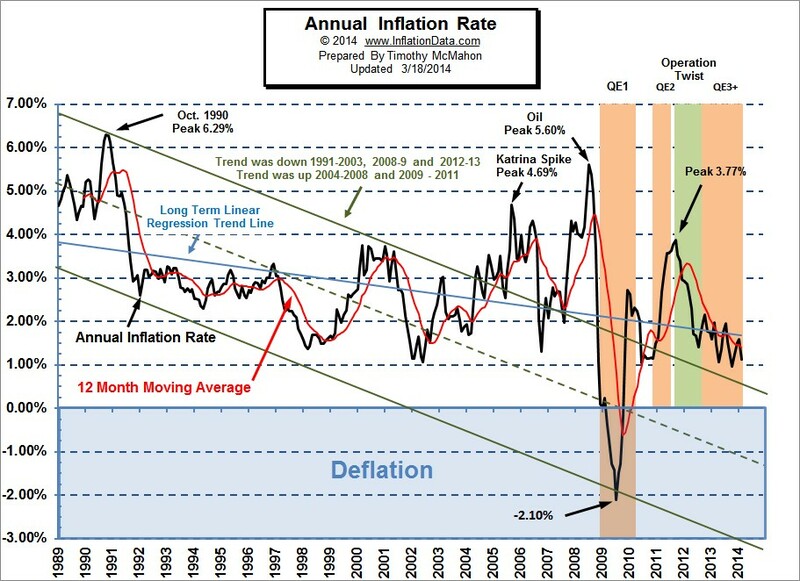 See Current Annual Inflation for full commentary on the current situation. The misery index as of March 2014 (based on the most recent official government data for February 2014) is at 7.83% down from a peak of 12.87% in both October and November 2011 which was pretty miserable. With inflation at historically low levels the major component of the Misery index is unemployment. However, if independent non-government numbers are used the misery index is closer to 10%. See full commentary of the index here. According to AAA the nationwide retail Cost of Gasoline (Regular) averaged $3.306 in January 2014 virtually identical to $3.29 in January 2013 it was up to $3.83 in February. One of the major increases in cost this month were due to a 4.1% increase in fuel oil over the month. Although electricity declined -0.4% over the month, it still rose 3.8% over the last year. Natural gas was another big gainer increasing 3.4% over the month and 8.3% over a year. This was primarily due to the extraordinary winter though and not a strictly monetary phenomenon. Airfares were up 2% for the month but still down -3.8% over a year. Hospital services continue to outpace inflation with a 1.5% monthly increase and a 4.7% annual increase. Food prices increased 0.3% for the month and 1.4% on an annual basis. The MIP was right on the money last month predicting a sharp drop in inflation. Our target range was a worst case low of 1.10% and a worst case high of 1.18% and a median projection of 1.14% and the announcement today was 1.13% so we couldn’t get much closer. See the Moore Inflation Predictor for more information on what to expect next. The New York Rate of Change chart has generated a sell signal which we are taking seriously. NASDAQ is still in buy territory but the most recent peak is looking very scary. Caution is advised. For more information on the Current Inflation Rate or the Historical Inflation Rate we have tables and charts for them.